Here the sun sets over Shiretoko Marsh (知床沼・Shiretoko Numa) on the northeastern tip of Hokkaido. If you've already seen the sun set over Shiretoko Marsh, head southwest for the sunrise over Lake Mashu (摩周湖・Mashu-ko) in Akan-Mashu National Park! The eastern shore of Lake Towada (十和田湖・Towada-ko) offers yet another stunning sunset vista. Jodogahama Beach (浄土ヶ浜・Jodogahama) is a scenic sunrise spot located on the east coast of Iwate Prefecture. No sunrise is more coveted than the first sunrise of the year over Mount Fuji! It's seen here from Mount Jizogatake (地蔵ヶ岳・Jizogatake) in the Hoo Sanzan Mountains (鳳凰三山・Hoo Sanzan). 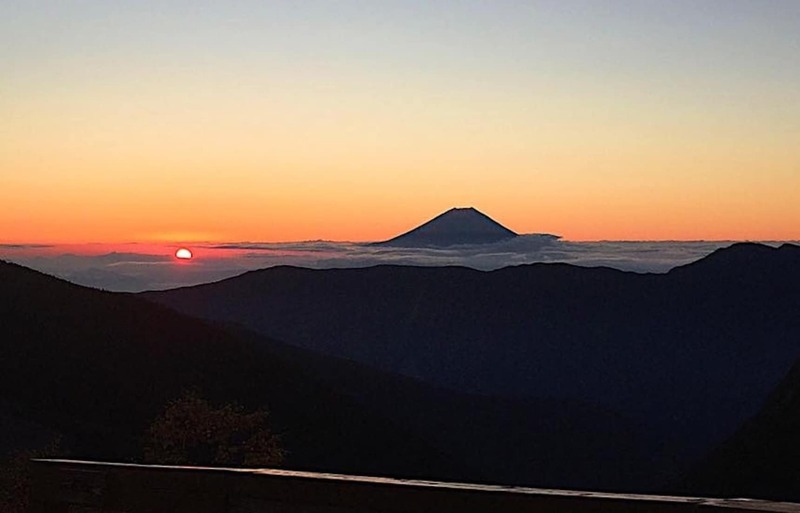 You can also see Mount Fuji to the right of the sunrise from Arakawa Hut (荒川小屋・Arakawa-koya), located in South Alps National Park. Sky and water turn crimson during sunset at Otago Beach (大田子海岸・Otago Kaigan), located on the west side of the Izu Peninsula. Alternatively, you can head to the southern tip of the Izu Peninsula to catch sunrise at Yumigahama Beach (弓ヶ浜・Yumigahama). You can get a lovely view of sunset over Kashiko-jima Island ((賢島・Kashiko-jima) from the observation area near Shima-Shinmei Station (志摩神明駅・Shima-Shinmei-eki) in eastern Mie. Autumn is an incredible time to catch a sunset at Fuseda Fureai Park (布施田ふれあい公園・Fuseda Fureai Koen) in Ise-Shima National Park. Mihonoseki (美保関) is a popular spot to catch the first sunrise of the year in Shimane Prefecture. This "Daruma Sunrise" (だるま朝日・Daruma Asahi) on the Oki (大岐) coast can only be seen when the conditions are just right. A Daruma is a red, round doll made in the image of a legless monk, a very common folk charm in Japan. This is the year's first sunrise over Mount Aso, seen from Kabuto Iwa Observation Point (かぶと岩展望所・Kabuto Iwa Tenbosho) in Aso-Kuju National Park. From this angle, the rocky crags of Mount Aso are said to resemble the profile of a reclining Buddha. Ensconced in the Kirishimayama mountain range, here the sun sets over the Ebino Plateau (えびの高原・Ebino Kogen), with Mount Io (硫黄山・Io-yama) in the background. Dazzled? Sun-besotted? Check out more from Japan's national parks on Facebook and Instagram!